This article was first broadcast in Episode Ten on 7th February 2018. Ostron: Will you calm down and listen! Ryu: Why is everyone yelling in here!? Ostron: It’s a sword that LOOKS silver, it’s not one of THOSE silver swords. Do I look like an idiot? Lennon: Well you work on this show, don’t you? Ryu: What am I missing here? 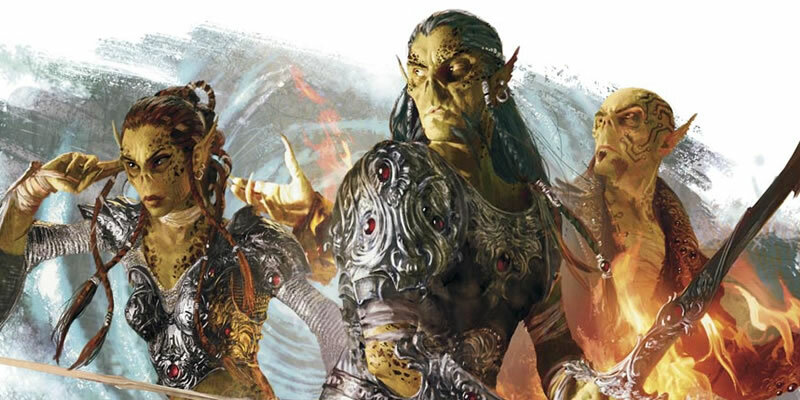 Whenever psionics comes up in D&D, three races are always brought up with it: the Mindflayers, Githyanki, and Githzerai. We’re going to discuss the latter two. Fortunately the history of these peoples hasn’t changed very much from their first appearance in D&D, although some details are downplayed in more recent editions. Back before most non-immortal races in D&D, the Illithids or mindflayers had an empire spanning multiple planes of existence, built upon the mindflayers’ psionic abilities and the backs of slaves. In sources where it was named, it had the name “Nihilath.” While some of the races that were enslaved include the Kao-toa and grimlocks, the most famous ones are the Gith. That wasn’t the original name of their race. In their first appearance in Advanced D&D, they had been humans, and a Dragon magazine in 2002 gave the original homeworld of the race as Zarum but in recent editions that connection has vanished and they’re always described as a distinct species. The name “Gith” comes from the figure that organized and led their rebellion against the mind flayers. In some sources, the Gith rebellion took place after a protracted conflict between the Illithids and a race of insectoids that was totally immune to psionics. The mindflayers had made the Gith their primary fighters, so by the end of the conflict the Illithids were exhausted and their slaves had a lot of fighting experience. After overthrowing the Illithids and forcing them to the Underdark, the Gith didn’t rest on their laurels; they immediately started fighting amongst themselves. An individual named Zerthimon disagreed with Gith’s approach to life and caused a philosophical divide so bad it actually split the Gith into two races: the Githyanki (the original followers of Gith) and the Githzerai, or the ones who went with Zerthimon. The legacy of the Githzerai is a bit simpler than the Githyanki; they reside in fortresses in the plane of Limbo, continually improving their mental focus both to increase their power and because in Limbo creatures need mental focus to create solid places to live. Their traditions and society are very isolationist and they usually only fight against Illithids or Githyanki. The other races of the planes are insignificant and ignored unless they directly attack. As for Zerthimon, some sources have him dying in combat with Gith, while others say he won and granted Gith mercy, then later died of natural causes. The Githyanki follow a more martial tradition borne from their rebellion. They’re essentially Vikings who travel between planes, raiding areas for materials and wealth before returning to the Astral plane, where they maintain fortresses constructed on debris that drifts through the plane. One part of their tradition that’s always played up is the silver swords they carry. The exact capabilities and rarity of these swords varies from edition to edition, but they’re always capable of severing the so-called “silver cords” that link beings to their bodies if they’re engaging in astral projection. If a sword is lost, the results vary; in some editions a group of Githyanki is tasked with recovery, while in others recovery becomes a personal quest of the Githyanki who lost it. The latter interpretation is more common. The most detailed story told about Gith herself says that the wizard Vlaakith [VLAA-kith] eventually became her advisor and suggested they needed allies. The wizard arranged for Gith to speak with Dispater [dis-PAY-ter], lord of one of the Nine Hells. When she refused to pledge all of the Githyanki souls to him, he brokered a deal between her and Tiamat, or specifically Ephelomon [eph-EL-oh-mon], her red Abishai [ab-eh-SHY] devil associate. He agreed to pledge the assistance of red dragons to the Githyanki. Githyanki can therefore be found working with or even riding red dragons as mounts. Gith remained behind in the Nine Hells as a guarantee that Dispater would uphold the deal, and Vlaakith, now a lich, has led the Githyanki ever since. Her paranoia about losing power leads to her eliminating Githyanki who grow too strong. In many editions, no Githyanki over a certain level exist because Vlaakith absorbs their souls. Some Githyanki submit to this willingly, while others have to be dragged. Ryu: So… you thought Ostron had stolen a Githyanki silver sword and one of them was going to show up? Lennon: Well, with all this talk of planeswalking, you can’t be too careful! Ryu: Are you on cough syrup again? Lennon: … I like the cherry flavour.